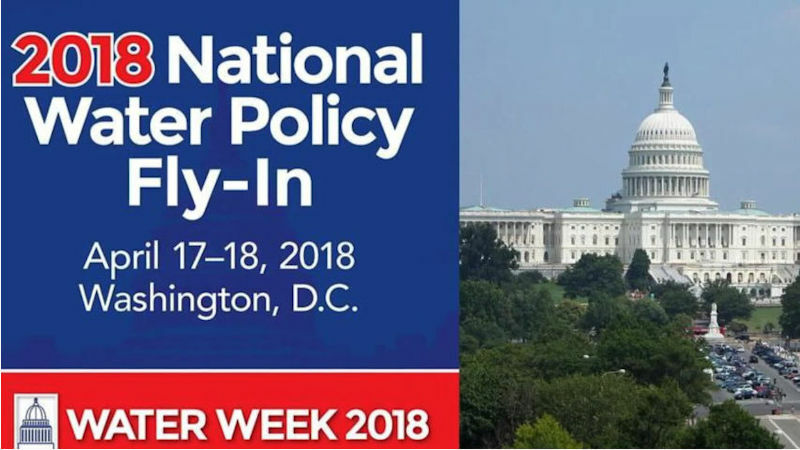 During Water Week, more than 250 individuals participated in the 2018 National Water Policy Fly-In, held April 17–18. Water professionals representing drinking water, wastewater, and stormwater gathered on Capitol Hill in Washington, D.C., to meet with lawmakers and advocate for national policies that advance clean, safe, and sustainable water. Participants had the opportunity to hear from and engage with top officials of the Trump administration and key members of the U.S. Congress. Speeches and roundtable discussions covered a variety of topics including research, reuse, integrated planning, and the Water Infrastructure Finance and Innovation Act. The Water Environment Federation (WEF; Alexandria, Va.) awarded scholarships for young professionals (YPs) to attend. WEF hosted the event with the National Association of Clean Water Agencies (Washington, D.C.), WateReuse (Alexandria, Va.), and The Water Research Foundation (Denver). Learn about Carol Kinzer’s experience at the event in the YP Connections article, “Reflecting on the Water Week National Water Policy Fly-In.” Kinzer is an engineer at Trihydro Corp. (Laramie, Wy.) and a member of the WEF Students and Young Professionals Committee.